Bart, I've seen missing animations on each of the select screens in Daytona USA 2 (the drop down box that reveals the course image) is it related to the other unimplemented 3d graphic features? Bart,you are a genius and we love you man! Bart wrote: I started looking into specular lighting today. Specular lighting basically makes things look shiny or glossy. I'm fairly confident that some of the polygon header bits that control it have been located (in fact, Stefano Teso identified the bit fields way back in the days of the original Supermodel project but he wasn't sure what they did). I coded up specular lighting in the shaders but I'm still unsure of how the shininess factor is encoded. I'm also wondering if there are some problems with my lighting vectors because the specular highlights are occasionally absent during key times when they are employed as special effects. For example, at the start of the night-time beginner course in Scud Race when driving under the terminal, the vehicle is supposed to be lit up from above and I strongly suspect this is a trick achieved with specular highlights. I've had the best luck with Daytona USA 2 by decoding what I think is the shininess factor a particular way. Other games don't seem to like it, unfortunately. Below are some screenshots. Note the presence of additional light reflecting off the black surface of the vehicle. By contrast, In Supermodel v0.2a, black pixels remain black no matter what the lighting conditions are. I'll keep you guys updated. It's a relatively minor detail but something that I've been wanting to figure out since I began the rewrite last year. Hopefully it'll be working in v0.3a. Hmmm, shiny! Just from the screenshots there, I think the extra glossiness gives Daytona a look that's more similar to the arcade version. Great work Bart. I am curious about spectacular in scud race!! I love your daytona's screens man! If you can please upload screen shots of scud race with this new effect,i will be very happy! Progress with the "Specular Light" is fantastic, I captured some images to compare with the real hardware. The specular effect is still not working well enough to show off more images. I've been watching some videos Abelardo has recorded previously and although it looks almost correct in some places, in many others it is definitely not correct. There seem to be two problems: interpreting the "shininess" parameter and determining how the vectors are calculated on Model 3. It does not appear to use the typical specular lighting formula that is widespread today (the Blinn-Phong model). This is going to be difficult to get right and will likely never be close to 100% accurate. Abelardo: If it's okay with you, I will come up with a small list of specific things I would like to see filmed in Scud Race, Daytona 2, and maybe Lost World at some point in the next week or two. For now, your existing videos are helpful enough. 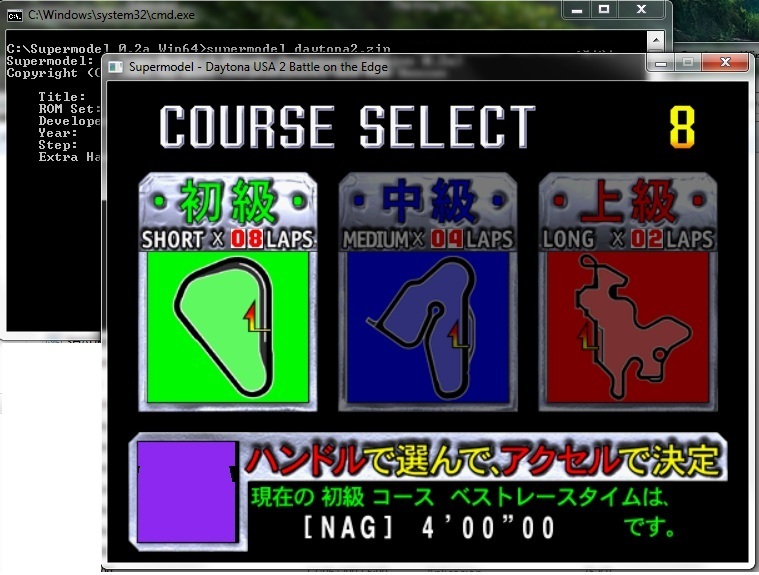 Jiterdomer wrote: Bart, I've seen missing animations on each of the select screens in Daytona USA 2 (the drop down box that reveals the course image) is it related to the other unimplemented 3d graphic features? I'm not sure at the moment what's causing this but haven't looked into it extensively yet. Bart wrote: Abelardo: If it's okay with you, I will come up with a small list of specific things I would like to see filmed in Scud Race, Daytona 2, and maybe Lost World at some point in the next week or two. For now, your existing videos are helpful enough. Ok, I can help, I can take any video or photo to compare.